This book really pulled at my heart strings and it was all Grayson’s doing. I have read many books where the man is a lot older than the woman but in this one it has an edge. This man is extremely vulnerable and it is that vulnerability that draws you into this story hook, line and sinker. Grayson is in his forties, but he lives a life of seclusion, he keeps himself to himself. Day to day living is hard for him. He is locked up inside his mind and lives in a nigh on derelict house that is unsafe, but for him, this is the only place he has ever felt at home. He has gone through so much in his life but even though he has had it tough and battles Schizophrenia that is medicated he still managed to build a successful business and have a family. When fate intervenes though and he is left alone he becomes a recluse. Angie is a nursing student and is self-financing; she needs to earn some extra funds and so responds to a note on a noticeboard asking for someone to do a house clearance/clean up. She goes to an affluent apartment and meets Charles a nineteen year old man who is also a complete douche! Totally self-absorbed, cocky, arrogant and extremely self-entitled. The house is his father’s but he is a bit of a hoarder and he wants it cleaned out so that he can undertake some repairs to the house to make it safe and secure for him. His only piece of advice, DO NOT GO UPSTAIRS. Apparently his father is dangerous so under no circumstances invade his personal space. I will say the way that Angie and Grayson first meet was off the charts incredibly hot!! I mean, I needed to fan myself a little; total voyeurism on Angie’s part but the heat that radiated off the pages was seriously off the thermometer. The passing moments that these two shared were beautiful and perfect. Angie soon wised up to Grayson’s problems and she could read between the lines. At first you felt that she pitied him being alone constantly but it soon becomes apparent that there is that undeniable chemistry and it is reciprocated. She could have technically been his daughter with the age gap but these two together were undeniably suited. Yes Grayson needed Angie, but also Angie needed Grayson, the chemistry was palpable, the intensity of their connection was so strong, you felt the love, you felt the passion, you just felt everything. Yes this book has some smoking hot scenes but this book is also intensely emotional. The connection that I had with Grayson and Angie was so strong. At times I wanted to jump into the kindle and give Grayson a huge hug and try and make everything just go away, he was so raw and so vulnerable, he was like a child trapped inside a man’s body in the beginning. Angie did wonders for Grayson, she slowly but surely built a friendship, took the baby steps needed to bring him out of his shell, she battled him to take his medication and yet they still had more battles to win. Grayson was extremely lucky to have Angie in his corner. Although she came across as soft in parts, this girl has balls and she was like a tigress when it came to fighting for the man she loved. It is this intensity though that shines through and you know that she is in it for the long haul. She loves this man with everything she has and no-one will take that away from her. 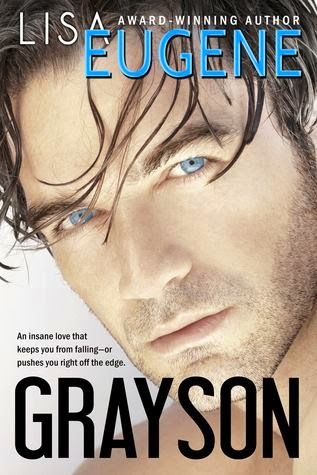 This was a fantastic read and Grayson will certainly stay with me for a long time. I felt that the author had covered this subject sensitively and with compassion, no glamorising at all. It felt true and real and I wouldn’t be surprised if this had come from experience or some very extensive research. This story was so believable and I think that is the reason that I became so intensely involved with these characters. You want to fight for them, you will them along, and fate has brought them together, now it is up to them to fight to stay there. Fab read and one that I highly recommend.